Sometimes customers want to avoid the formal procedures costly and that takes a lot of time and prefer to use an alternative to the conflict in order to facilitate the process of conflict resolution in an efficient, fast and more roads are used as a way to settle disputes rather than litigation is arbitration and the fact that arbitration allows for local and international companies more space to maneuver through giving greater weight to their intentions in decades, more than just a rigid implementation of the laws. The office has a team of lawyers experienced in mediation and arbitration. 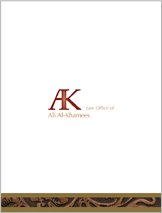 © 2014 Law Office Of Ali Al-Khamees . All rights reserved.